You decided to book a Costa Rica Family Vacation Package! Great! But now for the hard part. How can you choose between so many different destinations? The good news is that our vacation packages can all be customized to your specific desires. Perhaps you want to treat your family to an all-inclusive resort where the all-inclusive packages make for a blissful holiday without worry. Maybe you want to go horseback riding along the beautiful Guanacaste Coast or take a wild rafting trip on the Pacuare river. Or perhaps you would like to know more about some iconic coasts and one of the most famous volcanoes. Let us tell you all about it! This is the ultimate family Vacation Package! Fly into Juan Santamaría International Airport near Costa Rica’s capital city of San José. We’ll meet you at the airport, and you’ll hop aboard your private transfer to take you to your hotel located in the heart of the city and close to points of interest such as the “Plaza de la Cultura,” “Teatro Nacional,” museums and more. Welcome! Let the trip begin! Get ready to explore Costa Rica’s Northern Caribbean Coast and the canals of Tortuguero! Leave your hotel early in the morning and enjoy the scenery as you pass through the incredible Braulio Carrillo National Park, banana plantations and finally the mangroves and canals of Tortuguero on your way to one of the area’s best hotels. Have lunch, then explore the picturesque town of Tortuguero – all meals are included during your stay here! 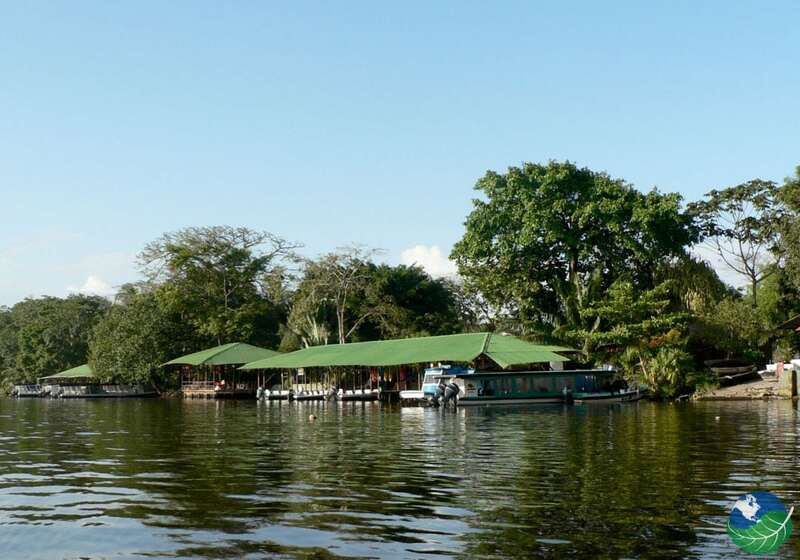 Enjoy nature at its best as you undertake a journey through the canals of Tortuguero early in the morning. You’ll have a chance to see a wide variety of birds and animals like monkeys and crocodiles in this unique paradise of magnificent flora and fauna. At night, take an option tour along the beach where you might get a chance to admire a nesting green turtle (best July to September). 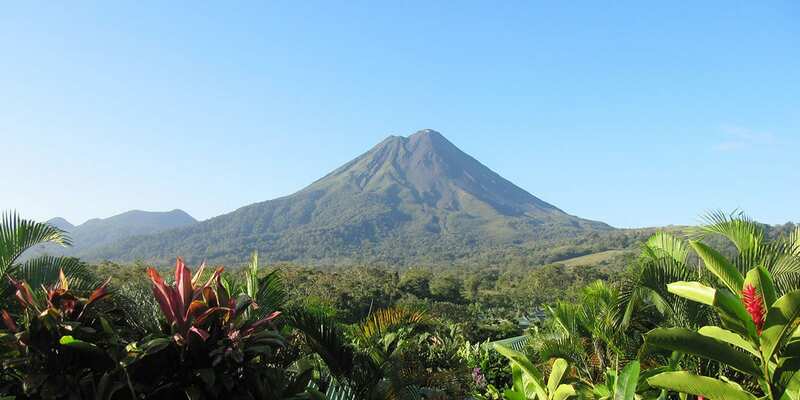 Have breakfast and then get ready to head to the majestic Arenal Volcano. 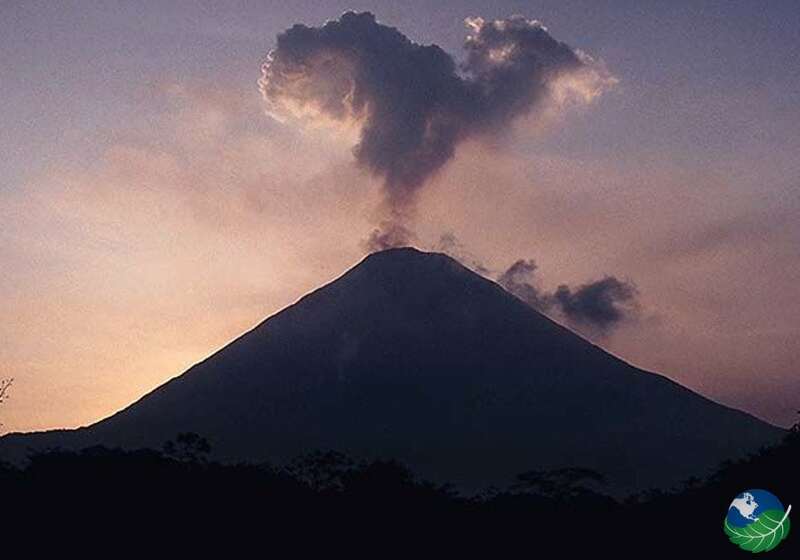 Check in to the hotel in Arenal and then prepare to hike to an observation point where you’ll get a chance to see the most famous active volcano in Costa Rica. 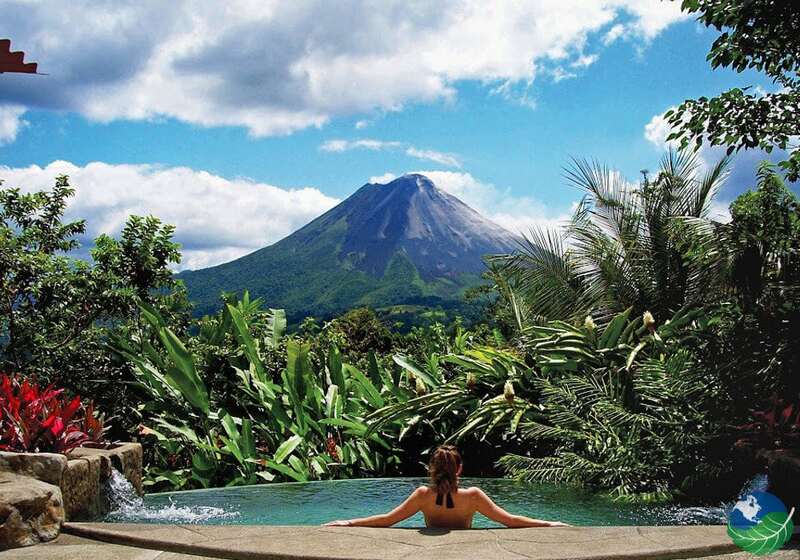 in Arenal you have a choice fo many Costa Rica Tours such as a hike the various trails of the tropical rainforest, the La Fortuna Waterfall, the hanging bridges, ecotermales hot springs, anything you want! Experience the rainforest like never before as you fly from tree top to tree top on a series of cables and platforms in the treetops on the canopy tour. An amazing experience! The sky trek will keep he adrenaline junkies happy while the sky tram is perfect for those who want to slowly experience the canopy while getting a better chance to observe the natural wonders Arenal is so famous for. Take a shuttle over to the beautiful beaches of Manuel Antonio, some of Costa Rica’s best! Take the Manuel Antonio National Park Tour! This tour contains a unique combination of distinct habitats including rainforest, mangrove swamp, beaches and coral reefs. The beaches are considered by many to be the most beautiful in the country, lined with prolific forest, and have excellent snorkeling. In the tropical forest you’ll find all manner of exotic species of iguanas, rare squirrel monkeys, sloths, and millions of colorful little crabs. There are 109 species of mammals and 184 species of birds. Observe coastal wildlife such as dolphins, migrating humpback whales, sea turtles, manta rays, and more on this Catamaran Island Adventure. After touring the coastline, you’ll anchor in a protected cove for snorkeling – the perfect end to your vacation! Get ready for a shuttle back to San José and enjoy your last night in Costa Rica. Bye for now Costa Rica! How did you enjoy your trip to Costa Rica? Any idea where you want to go next? Let us know! 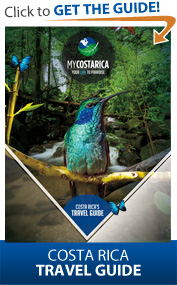 We will help you travel to your next Costa Rica destination! All taxes Included, perks noted where they apply. San Jose. Pool, Jacuzzi, Restaurant. TV, Internet access / Wi Fi, Phone, Safe Box, Private Jacuzzi, Mini Bar / Fridge, Coffee Maker, Hair Dryer. Concierge. Tortuguero. Favorite. Nature Pool, Jacuzzi, Restaurant, Bar / Lounge, Shop, Walking / Hiking Trails. Internet access / Wi Fi, Safe Box, Hair Dryer. Laundry Service. Arenal. Favorite. Family Friendly, Adventure, Volcano Spa, Pool, Restaurant, Shop. TV, Phone, Safe Box, Hair Dryer. Laundry Service, Concierge, Room Service. Manuel Antonio. Favorite. Beachfront Pool, Jacuzzi, Restaurant. TV. Concierge. 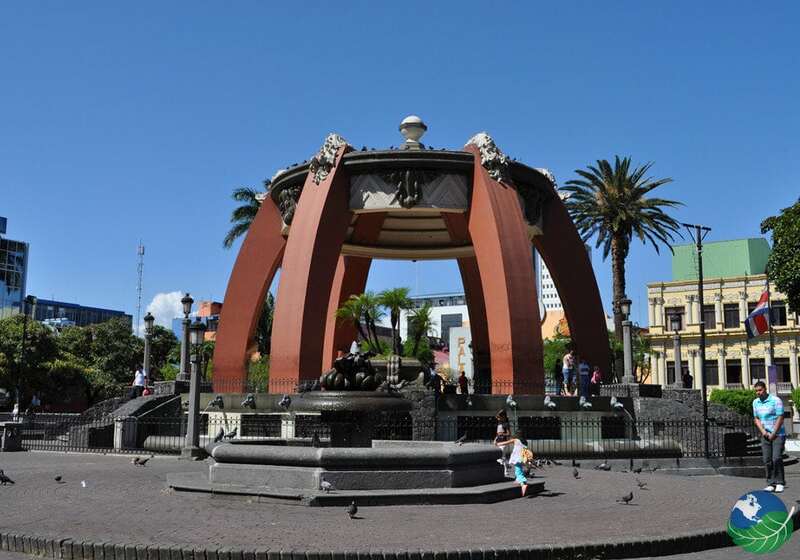 Alajuela, San Jose. Favorite. Pool, Shop. TV, Phone, Safe Box, Hair Dryer. Laundry Service, Concierge, Room Service. San Jose. Favorite. Boutique Jacuzzi, Restaurant, Shop. TV, Phone, Safe Box, Private Jacuzzi. Laundry Service, Concierge, Room Service. Tortuguero. Nature Spa, Pool, Restaurant. Arenal. Favorite. Family Friendly, Adventure, Volcano, Hot Springs Spa, Pool, Restaurant, Shop. TV, Phone, Safe Box, Hair Dryer. Laundry Service, Concierge. Manuel Antonio. Favorite. Family Friendly, Adventure, Sustainable Ecolodge Spa, Pool, Jacuzzi, Restaurant. TV, Safe Box, Private Jacuzzi. Concierge. Escazu. Luxury Spa, Pool, Restaurant, Shop. TV, Phone, Safe Box. Babysitting Service, Laundry Service, Concierge, Room Service. Tortuguero. Boutique, Nature, Luxury Spa, Pool, Fitness Room / Gym, Restaurant, Bar / Lounge, Walking / Hiking Trails. A/C, TV, Internet access / Wi Fi, Private Balcony / Terrace, Mini Bar / Fridge, Coffee Maker, Hair Dryer. Laundry Service. Arenal. Favorite. Romantic, Luxury, Volcano, Hot Springs Spa, Pool, Jacuzzi, Restaurant, Shop. TV, DVD Player, Phone, Safe Box, Hair Dryer. Babysitting Service, Laundry Service, Concierge, Room Service. Manuel Antonio. Favorite. Family, Nature Guide, Drinks, Snack, Transfer, Equipment, Entrance Fee. Arenal, Manuel Antonio, San Jose, Tortuguero. * The prices listed are subject to change at any time, you will receive a 100% exact price at the time of the quote. The rates listed here are per person of double occupancy and include taxes, domestic transportation, tours and hotels as described. The price DOES NOT include international air tickets or any other service not mentioned, includes the optional travel insurance. © Copyright 2004-2019 all rights reserved. CostaRica.Org is a Travel Agency that offers Custom Costa Rica Vacations & Packages Including Hotels, All-Inclusive Resorts and Tours.